Moving is an incredibly stressful time, and you don’t want to make it more stressful by choosing to hire movers in Spokane that won’t do a great job. Choosing the right movers can have a huge impact on the quality of your move. The Census Bureau reports that 16.8% of Americans have needed to relocate since 1980. In addition, about 63% of adults have moved somewhere new at some point in their lifetime, while only 37% have never left their hometowns. Renters are especially prone to relocation, with one-third moving each year. Check out our tips on finding the best possible company to handle your move! When you have a local mover come in to see what you have that needs to be moved, check on how thorough they are. If they don’t spare much more than a glance around each room before throwing an estimate out there, it’s almost certain that the estimate will be very off. The key is to sit down with the movers beforehand and figure out what you’ll be moving from your old home to your new one, as well as how much those things will weigh. Much of what a moving company charges is based on weight and space taken up in the truck, so take this into account. This is incredibly important. If you have any friends who have recently moved, ask them what company they used and what the experience was like. You likely have a short list of what you’re looking for in a company, so asking around will allow you to see which ones match up. This goes for any business transaction really, but don’t forget that anything you or the movers do should be in writing. This protects both you and the company should anything go wrong. The only things that will hold up in a court of law will be those in writing. In addition, it just gives you peace of mind — you’ll know where your things are and when they’ll get to the new home. Will you be using these tips to assess potential movers in Spokane? What is the most important thing to you in a moving company? While the thought of moving might seem too stressful to bother considering it, there are many situations where a new living space might be just the thing you need. According to the U.S. Census Bureau, every year about 43 million Americans (16.8% of the population) end up having to relocate. Moving offers you a change of surroundings and new possibilities for everyday life. Here are three situations that may warrant some new home searching. As time goes on, families grow. Be it new additions, or new possessions, it doesn’t take much for a family to outgrow a small house. As children grow older, they will likely desire to have their own space. If you have more than one child and only one bedroom to share between them, things may start to get a little tense. Moving to a larger house will relieve that stress, and may help a bickering family get a little change of scenery. Love your job, but don’t love the long commute that comes with it? Consider moving closer! Long morning commutes are stressful, and usually leave you feeling stressed and frustrated before the work day even begins. Instead of waking up hours early to make sure you get to work on time, why not look for a place that’s a little closer to work? That way you’ll get more sleep, and be able to start the day without having to sit through mindless traffic. In fact, the most frequently cited major reason that movers give for choosing their current community is job or business opportunities! When you first moved in, the neighbors were friendly and everything seemed quiet or peaceful. But as the years went on, your good neighbor luck ran out. Now you’re kept up by barking dogs, loud cars, or rambunctious pedestrians. If you feel uncomfortable in your own neighborhood, it’s likely a sign that you’re not in the right place. Find a neighborhood you feel best suits your lifestyle, and look for new places around that area. Chances are you will find a place you fall in love with. Moving out? Hire local movers! No matter why your reason, a moving company will help the move-out process run smoothly. Hiring local movers means that you can leave everything set up at your old house longer, and have it unpacked at your new house faster. Moving companies can also assist with home packing, and local movers provide clients with moving day tips to make sure they can get into their new home as quickly and pain-free as possible. While living with your parents might seem like a cheaper option, it can cost you in gas. If your morning commute is too long, it may be a sign that you should look for a place closer to your place of employment. You’ll save money on gas, and have more time to sleep in the mornings. For many young adults, the 20s are all about partying. However, it can be difficult to come home at late hours of the night when your parents are sleeping one room over. If you have to sneak out at night, or feel uncomfortable inviting people over to stay the night, it might be a good time to move out. If you’ve been in living in the same neighborhood for your entire life, it’s likely a sign that you should look for your own place. While 63% of adults have moved to a new community at least once in their lives, 37% of adults have never left their hometowns. A change of environment is a great way to add new purpose in your life. As we grow older, we acquire more and more possessions, all of which need a place to be stored. But your parents need to store their things too, and clutter can easily pile up when storage space runs out. With your own living space, you don’t have to keep all your possessions packed away, and you don’t have to share the space. If you think it’s time to move out, find local movers to make the process as quick and painless for you and your parents. Hiring a moving company means that you can leave everything set up at your parents’ house longer, and movers will have all your things unpacked at your new house or apartment faster. Moving is something most Americans have to do at least once — and probably several times — in their lives. Census Bureau data shows that, since 1980, about 43 million Americans have moved every year. That’s about 16.8% of the population. The figure is even higher for renters, about a third of whom move each year. And if you’ve found yourself among the ranks of movers before, you know that moving can be a real pain. When it comes to keeping organized over the course of packing, moving and unpacking, spreadsheets are the best weapon in your arsenal. Keep inventories that can be sorted by category, room and box number so that you know precisely where everything is at all times. As long as you enter the information bit by bit, it won’t seem like a huge task. As you’re packing, make sure you keep track of all the little items that go with bigger ones — picture hanging brackets, screws, remotes, cords, etc. Put these small items in plastic baggies and tape them to the back of their corresponding appliances or furniture pieces so that they’ll be handy as you start putting everything back together in your new home. Numbering boxes is still important, but you can also visually distinguish boxes for various rooms by using colored packing tape. When you’re staring at a sea of cardboard boxes, being able to sort them into rooms based on tape color alone will be a huge help. Be sure to know any limitations with your new space. That includes taking measurements of doorways, hallways, stairwells and elevators. You don’t want to find out on moving day that your king-sized bed won’t fit through the door of your master bedroom. 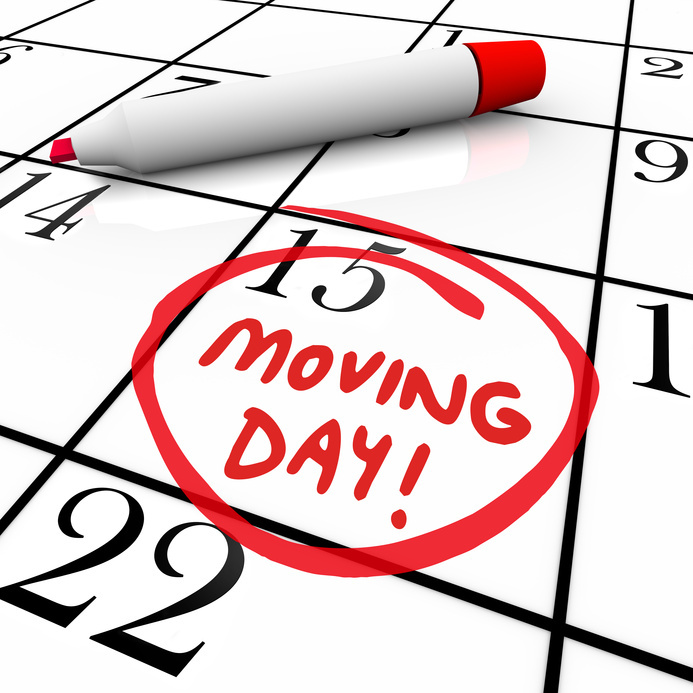 Keep your moving company in the loop regarding any plans or restrictions. Especially if you’re moving someplace with strict move-in rules (like many condos), they’ll need to know whatever you do to keep things on track. Have each family member pack a suitcase that could get them through a night or two without opening any of the packed boxes. The less tired you are when unpacking everything, the less likely things are to get chaotic. If you’re scheduling some big deliveries (such as a new couch or appliances), aim for a few days to a week after you first move. It’s better to sit on the floor for a while than be stacking up boxes trying to make space for more stuff. Got any other great little tips for packing and moving? Share them in the comments. If you’re one of the four-in-ten Americans who say they are likely to move within the next five years, your head is probably spinning from all the things that moving entails. Moving can be a difficult process, especially if you are moving out for the first time, or buying your new house. If you’re looking to relocate soon, here are some easy moving tips and advice that may help you get into your new home faster. Before you start the packing process, make sure you have plenty of supplies. You will need a lot of boxes, and heavy-duty tape to make sure they can be securely closed. Label each box with the room it’s meant to be in to make unpacking easier. Avoid mixing items from different rooms in the same box, as it can complicate the process, or cause misplaced items. When moving, it’s recommended to start with the kitchen, as it tends to be the room with the most items. It may also be a good idea to bundle breakable items, wrapping each with packing or newspaper to ensure their safe travel. Be sure to put heavier items on the bottom, and lighter items on the top. This will make it easier to carry, and will ensure that the more delicate items won’t get crushed. Other items, such as your television or furniture, should be wrapped in quilted furniture pads or special, padded crates. If the thought of having to pack up your entire house makes you cringe, you should consider hiring a moving company. Moving companies will send professional movers to pack up your own home, move all your belongings, and finally unpack everything in your new home. Hiring movers can be a great way to ease the stress of moving, and make the transition to your new home that much easier. There’s no ifs, ands, or buts about it: moving is stressful. You’d think getting your belongings — including yourself — from point A to point B is fairly simple. However, even small moves across town can easily go awry. Unfortunately — or fortunately depending on how you look at it — moving is simply a fact of life and something that you’ll likely have to do quite a few times. According to a recent research study, four out of 10 Americans say they are very likely or somewhat likely to move within five years. In addition, two thirds of Americans between the ages of 18 and 29 say they relocated within the past five years. Furthermore, every year in the United States a third of all renters will move. It seems that just about everyone is on the move these days! There’s no better way to move than with the help of professional moving companies or professional movers. Sure, your buddies may have strong backs, but the expertise and service professional local movers provide is unmatched and will make your move a whole lot easier. Finding the right moving company — especially during peak season — can be tricky. After all, running an internet search for “moving company Spokane” is likely to yield a number of different results that can be overwhelming. When running an internet search such as “moving company Spokane” for example, you may find it helpful to carefully read client reviews and testimonials. In addition, you can find further information about the movers or moving company by reaching out to your local Better Business Bureau (BBB) branch. Once you’ve narrowed down your list of possible movers or mover companies, it’s recommended to get an estimate or a quote. Keep in mind that the lowest cost or estimate isn’t always the best buy, especially if it is significantly lower than the others. Therefore, it’s important to ask questions and take your time making a final decision. It’s that time of year again, and it’s time to get moving. Sure, the warm weather that the spring and summer months bring are perfect for getting outdoors and stay active, however, the spring and summer months are also prime time for moving. Whether you’re moving into a college dorm room for the first time or are downsizing for retirement, moving is simply a part of life. According to the Census Bureau, since 1980, every year nearly 43 million Americans — roughly 16.8% of the population — end up having to relocate. The most commonly cited reason movers give for relocating is pursuing a job opportunity. Regardless of why you’re moving, it’s important to carefully plan out exactly how you’re going to get your belongings from point A to point B. Here are just a few of common mistakes people make while moving, as well as simple and easy moving tips to make the process easier. DIY is good for a lot of things and can save you a lot of money, however, in regards to moving, it’s a big no-no. Why not pay someone else to do the heavy lifting — pun intended — for you? Hiring a moving company or local movers allows you to leave everything set up at your old house longer and have it unpacked at your new house faster, which means you’ll be calling your new house a home that much sooner. While hiring a moving company is always advisable, it’s important to plan in advance. With well over 40 million Americans moving each year, the spring and summer are the busiest times of year for moving companies. As such, it’s important to get moving estimates or quote and book your dates as far in advance as possible. If anything changes in regards to dates, location, etc., notify them immediately. This is perhaps one of the most important easy moving tips to remember. In the chaos of moving, it can be easy to forget that your pet has to move as well. Schedule an appointment with your pet’s veterinarian shortly before moving day in order to make sure they’re healthy and current on all their shots, medications, certifications, and ID tags. Ask for travel recommendations in order to minimize the stress of moving for your pet. For the first Movher Muscle entry I had to do it on the man who has been this company’s anchor almost since its start date. That mover is Justyn Cozza, our fearless, and heavily tatted leader. When I first met Justyn I was intimidated. Here was this hulking man, covered in tattoos, who looked liked he’d seen his fair share of back ally bar brawls, but after a flawed driving maneuver and his ample descriptions of being a self-proclaimed sissy, I knew I was going to like working with this guy. Justyn’s background is as diverse and intriguing as the artwork that has taken up residency on his skin. Born in Scotland (yes, that Scotland) Justyn moved to Anchorage, Alaska at a young age where he spent his childhood years. It wasn’t until later in his life that he moved to Spokane, Washington, graduating from Mead High School in 2007. Justyn wasted no time entering higher education, beginning his college career the summer after he finished high school at a little college called Gonzaga University. Maybe you’ve heard of it? While attending Gonzaga he dabbled in many different disciplines, focusing mainly on health and fitness, but ultimately obtaining a bachelor of education in physical education. It was also during his tenure as a Zag that he was introduced to Jerry Almanza, the operations supervisor of Movher. Almost five years ago Justyn was offered a job at Movher, and after a couple months and a bartending job, he would accept a position with the company that would come to rely on him for so much. He is a jack-of-all-trades within Movher, starting out as a basic mover, working his way up to driver, then to where he is now as the crew supervisor and fellow estimator along side company owner, Sabrina Jones. Justyn plans on remaining with Movher to see the company through to its full potential, as well as his own. It’s not an easy gig, but honestly, I can think of no one better suited for the job than him. He is the man, the myth, the legend; with no regrets or apologies, only a staggering fear of spiders. Ladies and gentlemen, I give you Justyn Cozza. While moving can be an exciting time, the process of getting from point A to point B can be stressful to say the least. However, moving has become more and more common in today’s modern society, especially among millennials who are eagerly pursuing career prospects. Two-thirds of Americans between the ages of 18 and 29 say they have relocated within the past five years, with another 35.6% of those ages 20 to 24 relocating each year. In addition, 30.7% of millennials between 25 and 29 also relocate every year. However, millennials aren’t the only ones who relocate frequently. Every year in the United States, one third of all renters relocate. Now that’s a lot of moving. As such, winter is a great time to flesh out your next move. Here are some helpful tips for packing and moving. One of the best tips for moving out of your apartment, home, or even office space is to take stock of exactly how much stuff you have. Taking advantage of moving organization tips can greatly expedite the moving process. Ask yourself questions such as, what am I selling, donating, or keeping? How many fragile items do I have? Should I hire movers? Moving companies can make the entire process of relocating a lot less stressful. Getting and staying organized is perhaps one of the most important tips for packing and moving out of your space. It’s never too early to start the process by packing and labeling items you currently don’t use but plan on taking with you or putting in storage. A sharpie and post it notes will become your best friend! Last but not least in tips for packing and moving is finding local movers to get your stuff from here to there. While recruiting family members and friends can be helpful — and economical — if you only have a few items, large scale moves such as an entire apartment or home require heavy lifting (pun intended). As such, professional movers can help move and set up your space so it can begin feeling like home in no time. Moving can be a really exciting time. After all, it feels like a great adventure or the opportunity to start fresh. However, if you’re not probably prepared, then moving can be a frustrating if not stressful experience. Luckily, it doesn’t have to be. If you’re like many other Americans, you may have moved within the past few years and are perhaps preparing to move again this spring or summer. In fact, more people are moving more often. According to the U.S. Census Bureau, since 1980, an estimated 43 million Americans — 16.8% of the population — ended up relocating for a variety of reasons, whether it be to pursue a new job opportunity or moving to a more affordable location. Regardless of the reason you’re moving, it’s important to stick to moving organization tips in order to ensure a smooth, affordable move. Here are a few easy moving tips to help get you from here to there. Organization is key in terms of moving, and one of the best tips for moving out is to draw up a basic floor plan for your new space. Then, lay out exactly where you’d like your large furniture items and boxes to be placed in your residence office. This will allow the local movers or your friends to work faster and more efficiently, which in turn saves them time and you money. Let’s face it, moving can be pretty chaotic at times, which is why it is so important to be there when your items are being packed and moved. Whether you are using friends or a professional moving company, it’s important to be present in order to act as a guide and properly coordinate the move. This also minimizes the chance of any damage done to your items. One of the most important moving organization tips you should be sure to stick to is to label absolutely everything. This makes it much easier for your moving company or friends to get your items from point A to point B in one piece. Boxes should not be over packed, and every box should be clearly labeled with its contents and room it’s going to.